WASHINGTON, DC, August 31, 2012 (ENS) – The U.S. Fish and Wildlife Service today declared the Wyoming population of gray wolves to be recovered and removed federal protection under the Endangered Species Act. As of September 30, wolves in Wyoming will be managed by the state as they are in Idaho and Montana. 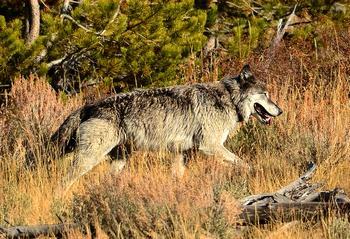 The delisting’s September 30 activation date is in time for Wyoming’s proposed October 1 wolf hunt. Jamie Rappaport Clark, president of Defenders of Wildlife and a former director of the U.S. Fish and Wildlife Service, blamed the Obama administration for what she called a “tragic” decision and threatened a lawsuit to reverse the delisting of wolves in Wyoming. “This is a low point in the modern history of wildlife conservation and a stunning move by an administration that vowed to be guided by sound science. We tried to work with the Obama administration, the U.S. Fish and Wildlife Service and state agencies to develop and implement more responsible wolf management plans, but we were dismissed,” Clark said. “Now we are left with no choice but to pursue legal action to ensure that a healthy, sustainable wolf population remains in Wyoming and across the Northern Rockies for many generations to come,” Clark said. Wyoming wolves will be managed as game animals year-round or protected in about 15,000 square miles in the northwestern portion of the state, including Yellowstone National Park, Grand Teton National Park, John D. Rockefeller, Jr. Memorial Parkway, adjacent U.S. Forest Service-designated Wilderness Areas, adjacent public and private lands, the National Elk Refuge, and most of the Wind River Indian Reservation. This area of Wyoming contains the majority of suitable wolf habitat within the state. Wolves will be designated as predatory animals in the remainder of the state. The protected and permanent game areas include the entire home range for 24 of Wyoming’s 27 breeding pairs, 40 of Wyoming’s 48 wolf packs, and 282 of the 328 individual wolves in the state at the end of 2011, according to the Fish and Wildlife Service. Ashe said Wyoming has committed to meeting its statutory and regulatory standards by managing for a buffer above minimum management targets. The management framework adopted by the state is designed to maintain at least 150 wolves and 15 breeding pairs in Wyoming. This is the same management objective as was adopted by the states of Montana and Idaho, he said. The State of Wyoming says in its Management Plan that it will commit to manage for at least 10 breeding pairs and at least 100 wolves in Wyoming outside Yellowstone National Park and the Wind River Indian Reservation. Under the Wyoming Management Plan, the state is committed to coordinate with Yellowstone National Park and the Wind River Indian Reservation to contribute to the “step-down recovery target” of at least 15 breeding pairs and at least 150 wolves statewide, including YNP and WRR. Existing Federal law prohibits hunting in Yellowstone National Park and Grand Teton National Park. No wolf hunting will occur in the John D. Rockefeller Jr. Memorial Parkway, the National Elk Refuge, and the Wind River Reservation in 2012, although hunting could occur in these three areas in future years, the Fish and Wildlife Service says. Beginning October 1, the state of Wyoming has authorized a take of 52 wolves in other portions of northwestern Wyoming’s Trophy Area in 2012. Current information from the Service indicates about 10 percent of the Greater Yellowstone Area wolf population resides outside the Trophy Game Area in Wyoming, where they have been designated as predators and can be taken with very few restrictions. Attorney Jenny Harbine with the nonprofit law firm Earthjustice said, “Wyoming’s open season on wolves in almost all of the state would allow aerial gunning of wolves and even killing wolf pups in their den. Wyoming law also allows unrestricted killing of wolves if they are found to be ‘harassing’ livestock or domestic animals, even if wolves are intentionally baited into the conflict. These policies could drive wolves back into local extinction. This is no way to responsibly manage wildlife on the border of Yellowstone – our nation’s first national park. The most recent official minimum population estimate shows that the entire Northern Rocky Mountain wolf population contains more than 1,774 adult wolves and more than 109 breeding pairs. The Service expects the Greater Yellowstone Area wolf population to maintain a long-term average of around 300 wolves, while the entire Northern Rocky Mountains Distinct Population Segment is expected to achieve a long-term average of around 1,000 wolves. “This administration is rewinding the clock and setting wolf recovery back at least a decade based on the numbers alone. The goal should be to sustain a fully recovered wolf population, not put it right back on life support,” said Clark. The estimated 1,774 adult Northern Rocky Mountain gray wolves occupy the southernmost 400 miles of a wolf population that numbers over 12,000 wolves in western Canada.